Aubrey Joseph as Tyron Johnson and Olivia Holt as Tandy Bowen in Freeform’s Cloak & Dagger. Out of all the live-action projects coming out of Marvel’s studios, Cloak & Dagger stands out in particular because of the work it took to update the original source material into something that people would actually want to watch in 2018. But so far, it’s looking much improved—and much more interesting. In Marvel’s comics, Tyrone Johnson and Tandy Bowen are transformed into the vigilante duo Cloak and Dagger after being exposed to strange chemicals that give him the ability to teleport through the Darkforce dimension and her the power to create daggers made of pure light. That’s a solid enough basis for a superhero origin story, but Cloak & Dagger creator Bill Mantlo went a step further and infused the series with the problematic ethos of the ‘80s era War on Drugs. When Tyrone (who is black) manifests his powers, for example, he’s plagued by an addiction-like hunger that could only be sated by the light emanating from Tandy (who is white). Though the two see one another as partners who make a much more effective team together, it’s difficult not to look back on those old Cloak & Dagger comics and not immediately pick up on the glaring, radicalized subtext. Thankfully, none of that seems to have crossed over into the Marvel Cinematic Universe’s take on Tyrone and Tandy. In this new trailer, we’re introduced to them once again and shown just how different their lives are. The kids’ socioeconomic status are swapped from the comics with Tyrone’s family being upper middle-class, while Tandy comes from a working class background. Different as they are, though, a voiceover in the trailer explains that they’re a “divine pairing”—apparently the latest in a long line—whose fates are intertwined. 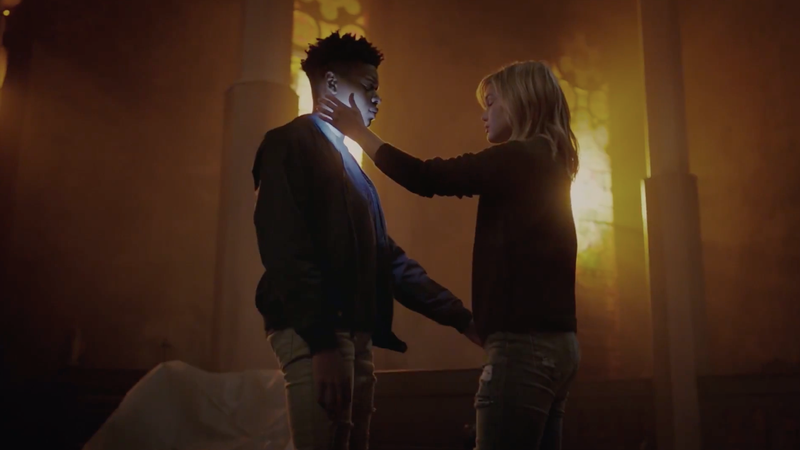 Given that Cloak & Dagger was shot and is set in New Orleans, it’s safe to assume that the series will feature a fair amount of religious imagery. But the unsubtle hints scattered throughout the new trailer suggests that whatever shady organization is watching Tyrone and Tandy (surprise: it’s Roxxon) might actually see the as the keys to something more supernatural instead of just extraordinary. Cloak & Dagger premieres on June 7.